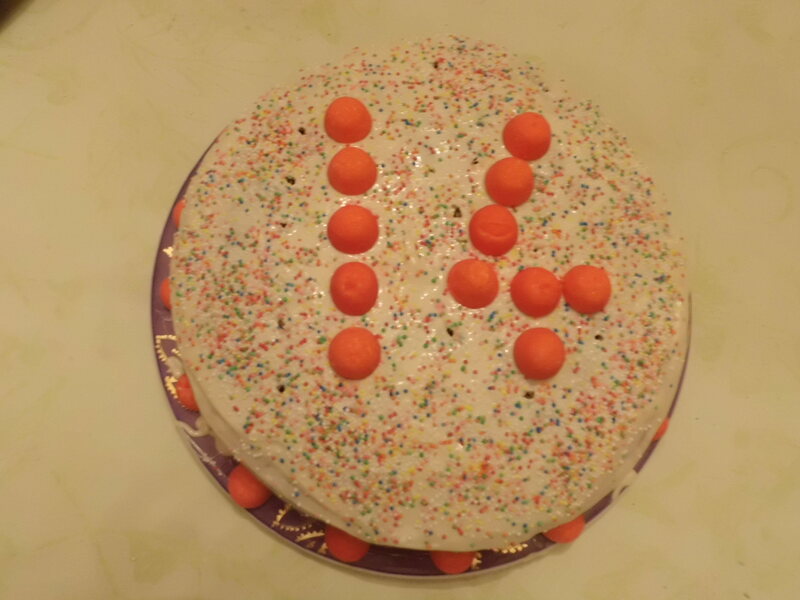 This day, was by coincidance, my birthday!!!!! 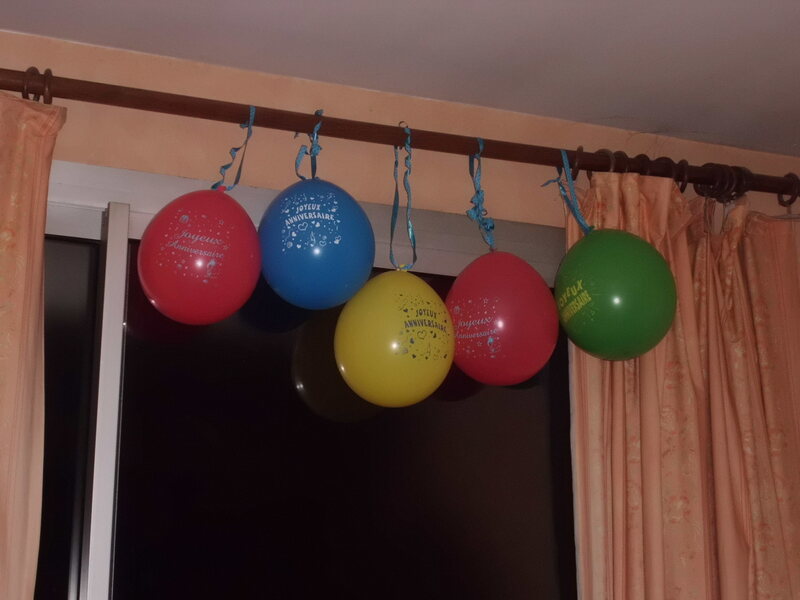 So when I got up and went into the kitchen there were garlands and balloons hanging there and the plates, well my plate (the other ones didn´t necessarily have plates) had a napkin on it, saying; “Joyeux Anniversaire”. I was so happy, also because a lot of people (like my parents and friends) had already called me to say Happy B-Day!! My host-dad drove us to school and from there we drove by bus to Tours. 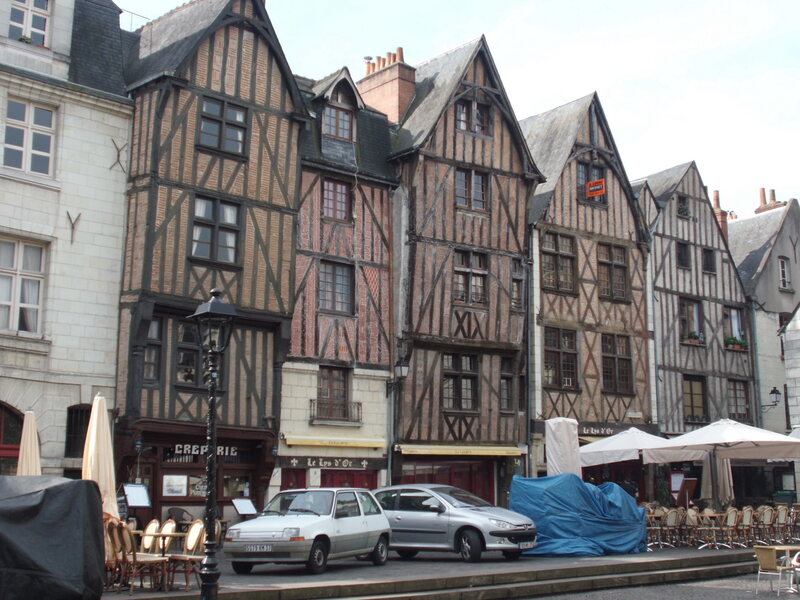 It´s the next big city in the east of Saumur. Maybe that some of you are connecting; Tours; Martin= St. Martin of Tours, which is right. He was the third Bishop of Tours. 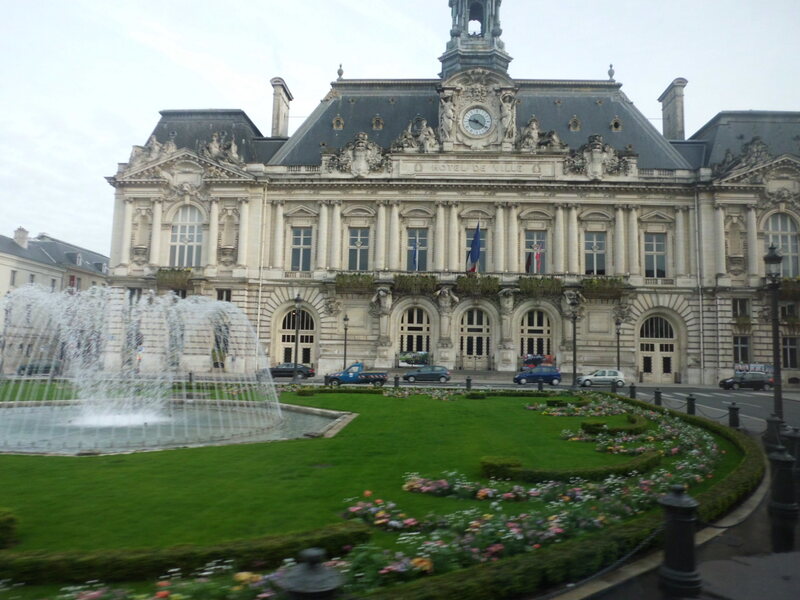 We had a guided tour in Tours (;-)). We walked 2 hours through the city. I have to say it is pretty pretty. We visited the cathedral of St Martin. And his grave. The city is quite nice, there are many things to see there. But I would have liked to stay at different places longer and therefore not go at all at other ones. Like there were little passages and little streets with cute Shops lined next to each other and I´d have liked to go into them, but we had to go on. All in one, I thought the City was nice, and it´s worth it to go there. I just wouldn´t stay there longer than two or three days. One day´s just fine. Then we went back into our bus and drove to the Castle Azay-le-Rideau, where we got time to eat the picknick, which our host-families gave us. I, for instance, had two Baguettes, one with Bacon, cucumbers, and mustard, and one with fish and mustard. This might sound weird but it was really good. After eating and walking around the cute, tiny city, we had a guided tour through the castle. I have to say the castle was nice, but the tour wasn´t as good. It just dragged on. Well, I survived it! 😉 The castle Azay-le-Rideau was built in the early 16th century, on a tiny Island. It is built in the style of the early French Renaissance and nowadays one of the most popular castles of the Loire-valley. Inside there is much to see, like tapestrys, each with their own story, the staircase in a white stone, and rooms of all sorts. There is one room where you think it is a pretty small room with a pretty small bed, but actually it is a big room with 50 squaremeters = 538 squarefeet and a bed two meters long= 6 feet 6 Inch. Amazing, isn´t it? The walls of this room are covered by woven stuff-sorry I don´t remember what it was- so the heat of the fireplace would keep inside. And there are a lot of big pillows on the bed. That all are optical illusions for us. Funny, right? For photos and more Information please click here. On the bus ride home everyone sang for me! 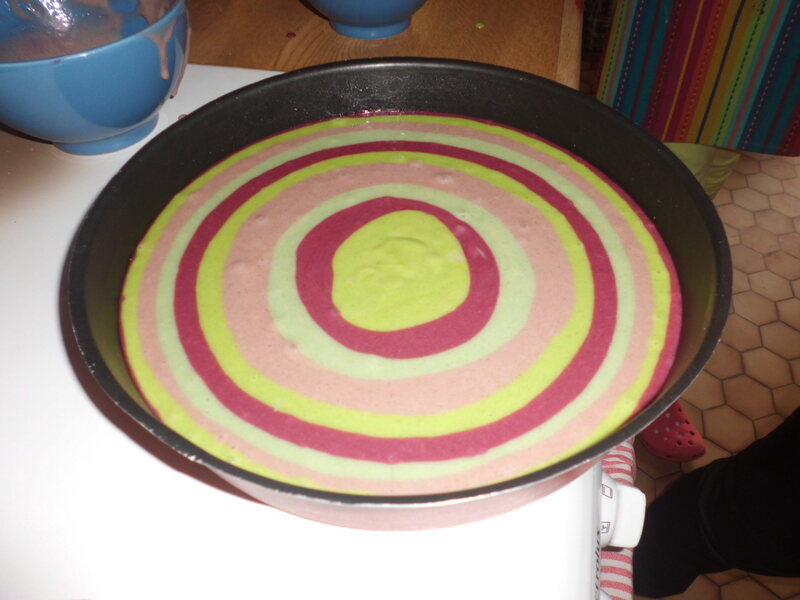 Then again at home, we made my birthday cake. It turned out soo pretty!! 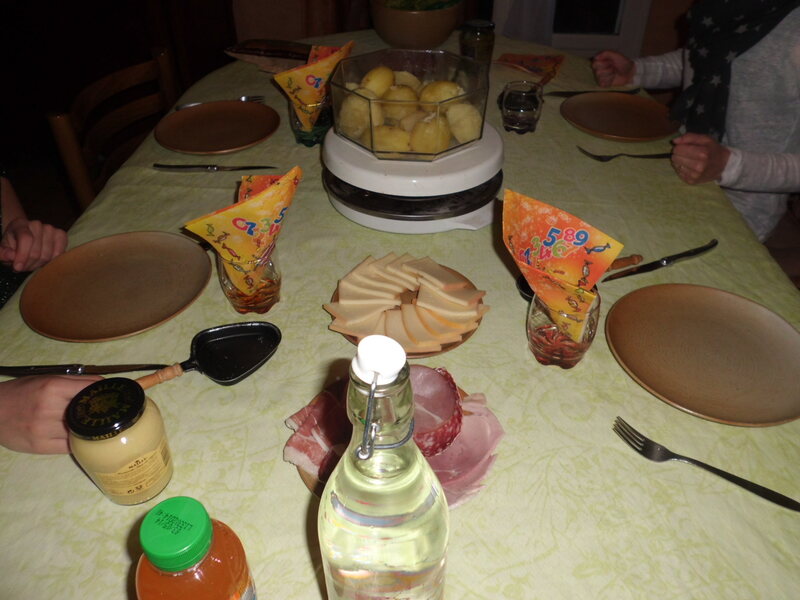 Then in the evening we ate raclette, and then my cake, for whom I sadly didn´t have much space left in my tummy, cause of the very yummy Raclette. The cake was carried in with a wonder candle and the whole family sung again. Can you imagine it? It´s dark outside, you´ve had an awesome dinner, everyone´s happy, you´re happy, it´s your birthday, and then the cake in carried in and the wonder candle fizzles and whisles, and everyone sings! 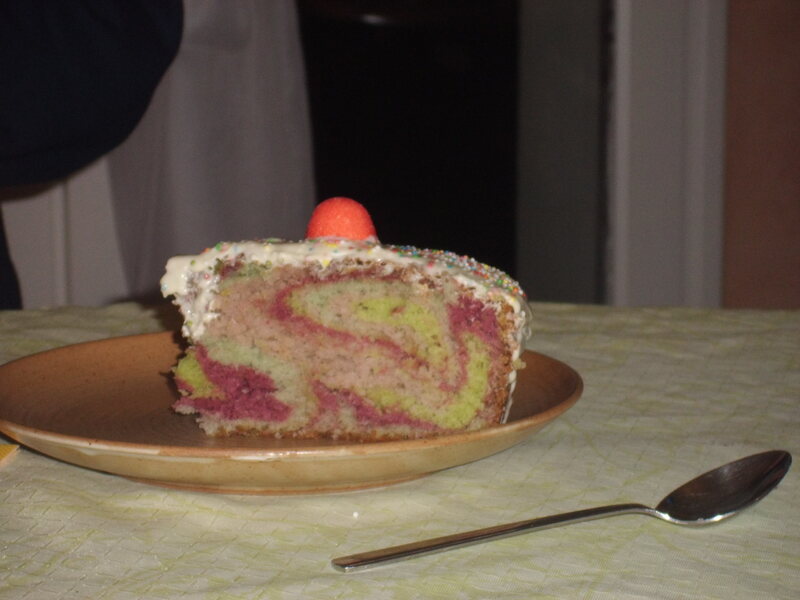 A rainbow cake, so astonishing how it looks, right?!?! OMG, I can´t describe that feeling!! 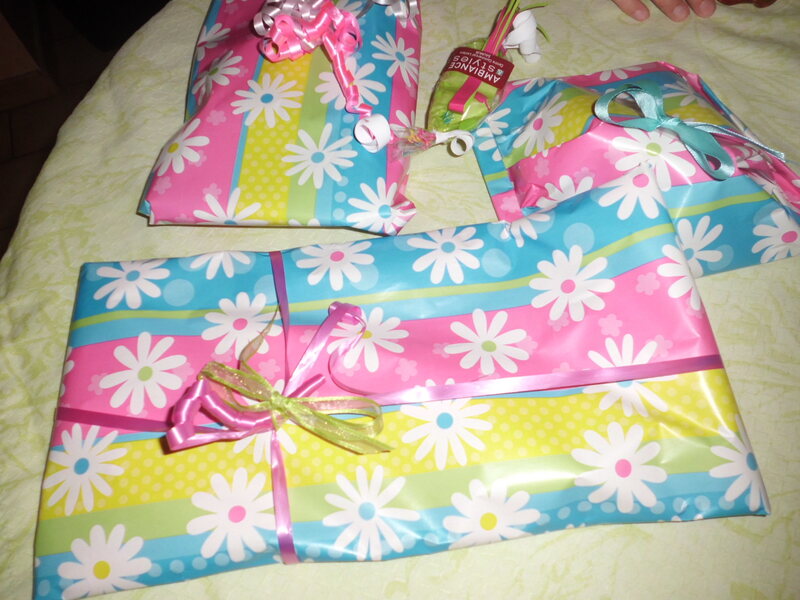 I was just sooo endless happy, and then I even got presents!! 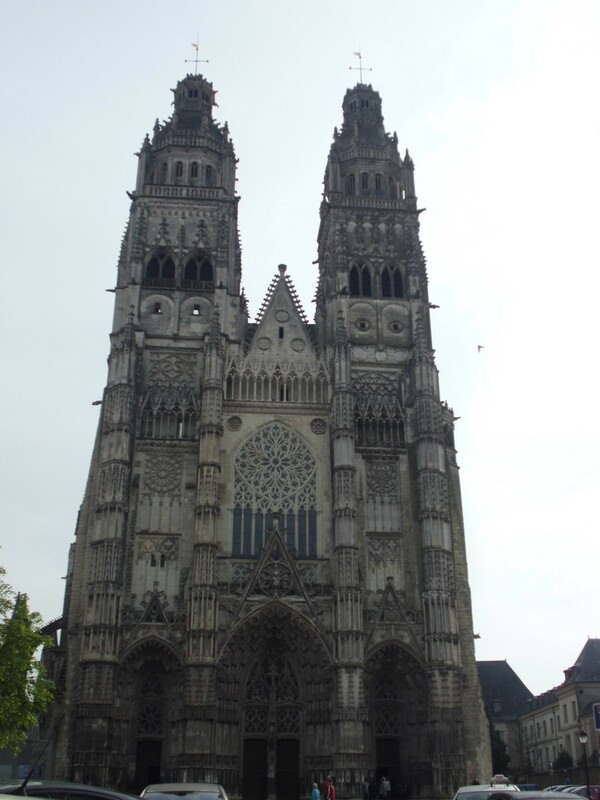 That was my third day in Saumur. If you did, please press the like button below to show me! Thanks! Great report! Liked it very much.